We are always very grateful when kids ask their friends and family to donate items to the shelter instead of giving them birthday gifts. Eleven year old Jack Bourdon went way beyond that when he asked friends and family, including his parents, to donate money to the shelter instead of giving him gifts for Christmas and Hanukkah (his family celebrates both). 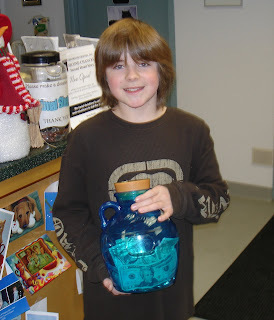 We were delighted when he showed up with the money he collected -- an impressive $269! Because he donated the money during our Matching Challenge Fundraiser, his donation will be doubled and will have an even greater impact. Jack epitomizes the spirit of the season and will soon be turning his fundraising skills to raising money for a new skate park in Medfield.